I am available to come along to creative writing, reading, or family history groups to talk about my work. Please feel free to contact me. I am happy to attend writers' groups and talk about getting your book into print and how to market your book successfully. I would be delighted to attend one of your sessions to discuss the book with you and answer questions. 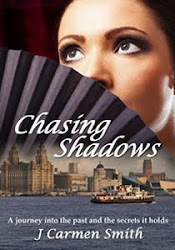 It is a privilege to be asked to speak to a reading group when the book under discussion is Chasing Shadows. The most common reaction is that members feel they can relate to the themes in the book on a personal level. It is surprising how many of us are descended from immigrant ancestors. I can attend family history groups to share my experiences of tracing family history, especially the challenges of doing so abroad. These talks have also been well received and I am looking forward to fulfilling my forthcoming bookings. Whether you are a discussion group or any other organisation that meets for informed and entertaining discussions, I can talk about many aspects of writing and family history. I have spoken at a Barnado's Luncheon Club attended by almost 60 ladies, also various NAWCs, Townswomen's Guilds, etc. I am happy to speak to small, or large, groups.